Just what you need for epic rides! 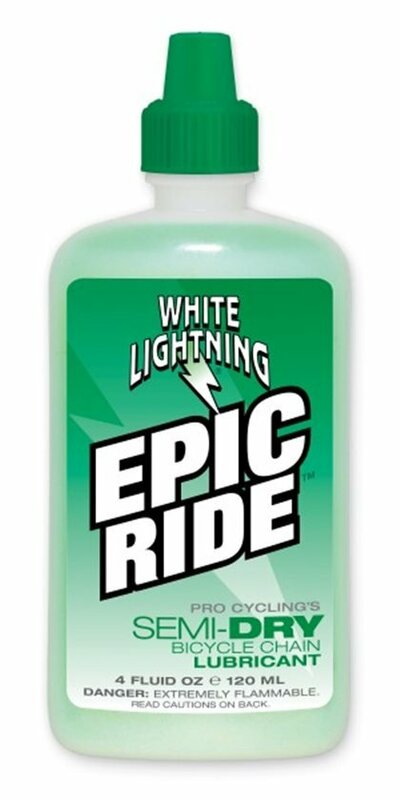 Other lubes dry out or wash off during an all-day ride, but not "Epic" from White Lightning. It holds up to wet weather conditions, and is suitable for use on chains, cables, and derailleurs. One of the best lubes you can buy for great shifting in wet conditions. Don't buy! I seriously don't know how anyone reviewed this stuff good. Go look at www.mtbr.com and you will see tons of people saying the same thing. It have nothing to do with other lubes or how I am putting it on either. Everyone I ride with has the same problems with this garbage, even with a solvent cleaned new chain. Just buy normal White Lightning or Rock N' Roll and you will be 10x happier. Unfortunately this is the first review I have to give 1-star too. This product is so "watered-down" (chemically they use ether, not water, to dilute it), that you have to use two or three times the amount as other lubes to get adequate coverage that lasts. Believe me, when you apply this lube, all you will smell is a strong pungent odor of ether used to dilute it. This lube bills itself as a semi-dry lube, meaning it doesn't contain wax or fluoropolymers like conventional dry lubes. Unfortunately it doesn't fair well for long-term use. I have to reapply after just a few rides (maybe 100 miles or so), wiping down the chain in between applications with a rag. If you apply too little lube to your chain, you will know instantly - your drivetrain will squeak like it's missing adequate lubricate while riding and there will ample 'feedback' of the drivetrain resistance while pedaling. As for the "all conditions" claim? I have to say you're better off buying a wet lube and a dry lube and applying them appropriately. In the dry conditions you can get away with this lube, but in the wet, it simply washes away too quickly. About the only good thing I can say about this lube is it's good for beginners who tend to apply way too much chain lube. I can't even say the cheap price is a positive, because you'll run through it faster than a quality lube because of it being so diluted. About me: I am a former professional MTB and collegiate XC racer, now turned avid cyclist for recreational fitness and enjoyment. I have over 15 years of cycling experience on all levels. Surprised at all the neg. reviews. I would not have purchased this product had I read them first. Fortunately, I didn't bother... I ride in Hawaii where the West side is desert-dusty and the rest of the island can be a muddy slimefest. Lots of rain. So I use this stuff in all conditions and am pleased. My method is pretty simple: After I've ridden maybe 40 miles or so, sometime before the next ride I'll flip my bike upside-down and run a stiff brush over the chainrings, cassette and chain. This takes maybe a minute. Then I apply a generous amount of WL Epic to the chain *rollers only*. That's it! My drive chain stays shiny clean and quiet. If I ride in the mud, I'll do the exact same method, it just takes an extra minute to knock all the dried mud off the chain. I commute all year long in a very wet and cold climate, Great all season lube. I've b een using Pedros Ice Wax for many years, and have been very satisfied. Lately, I've noticed that my chain and derraileur pully wheels hace been attreacting a gummy buildup, so I tried White Lightning Epic Ride. Have been very satisfied. I apply one drop to each link on my Mountain and Road bikes. Drivetrain operates smoothly with no noise. Chain seems to stay very clean.I clean drivetrain after about every 3rd ride(appox 50 miles) and re apply the lube. applies smoothly with good coverage of chain. need to reapply more often than some oil based lubes. Have used the product for years without issue. After years of using White Lightning I decided to try Epic. This lube tends to last longer than the original WL but unfortunately also tends to attract more gunk and does not ball up and fall off like the original WL. I had to brush the chain and gears more when using Epic. Overall, a good general purpose bike lube but would not use it on the chain under dusty conditions. As far as chain lube goes, this stuff is pretty bottom of the barrel. Seeking something that lasted longer than White Lightnings Clean Ride, I tried a bottle. I followed the directions and applied it to both my mountain and road bike chains and had some mixed results. On my mountain bike, which has Shimano components, it caused a good bit of drivetrain noise and was not smooth at all. I had better results using it on my road bike that is Sram equipped but the performance was still nothing to write home about. It keeps squeaks at bay for a long time but it caused all sort of clunks when shifting and you could feel much more chain/gear feedback in the pedals. Because it is a wet lube it does attract a fair amount of dirt. If you ride in dusty conditions, I'd look for something else. I stripped it all off and went back to the original Clean ride and despite having to apply it more frequently, I'm much happier with it's performance. It does however work surprisingly well for cable lube or for deraileur pivot points. Awful... save your time, frustration, and money. I bought it when lived back east when it was a bit more muggy/wet, but even still... terrible gunk build up. This stuff should be banned from dry climate riding. Go with Pedros Ice Wax. That stuff is perfect. Pedros Dry Lube is good for Moab/Desert riding.